Gynecological diseases represent a collective term given to different medical conditions specific to the female reproductive system. Thus, gynecological diseases include conditions affecting the uterus, ovaries and their appendages. Gynecology drugs are the therapeutics utilized for the treatment of various gynecological diseases and symptoms. The global gynecological devices market was valued at US$ 53,376.96 Mn in 2017. It is expected to expand at a CAGR of 5.5% from 2018 to 2026. In the last decade, the adoption of gynecology drugs has increased owing to the rise in prevalence of gynecological diseases. Change in lifestyle of the global female population has gradually enhanced their healthcare requirements. Consistent rise in awareness about health and well-being has led to an increase in the demand for better gynecological treatments. Sensing this opportunity, various drug manufacturers worldwide have devised more innovative gynecology therapeutics that have better efficacy and minimum side-effects. Furthermore, rising geriatric female population and economic growth are the key factors that are likely to offer lucrative opportunity to the gynecology drugs market. The global gynecology drugs market has been segmented based on therapeutics, indication, distribution channel, and region. Furthermore, in terms of therapeutics, the market has been divided into hormonal therapy and non-hormonal therapy. The non-hormonal therapy segment is likely to account for a leading share of the global market during the forecast period owing to the effectiveness of the products, rise in adoption of these products, and new product development. Decreasing use of hormonal products due to the risk of breast cancer has boosted the demand for non-hormonal pharmaceutical products. In terms of indication, the market has been classified into gynecology cancers, endometriosis, female infertility, menopausal disorder, gynecology infections, polycystic ovary syndrome, contraception (birth control), and others. In terms of distribution channel, the market has been segregated into hospital pharmacies, retail pharmacies, and online pharmacies. The online pharmacies segment is expected to expand at a significant CAGR during forecast period, owing to the convenience of using online pharmacy and rise in number of internet users. In terms of region, the global gynecology drugs market has been segmented into five major regions: North America, Europe, Asia Pacific, Latin America, and Middle East & Africa. North America accounted for a major share of the global market in 2017, primarily due to high investments made in cutting-edge drug research, resulting in new, sophisticated treatments with specific mechanism of action; rising emphasis on cancer care, and concentration of some of the world’s major pharmaceutical and biotechnology organizations in the region. The market in Asia Pacific is anticipated to be highly attractive in the near future due to the existence of a large patient pool, increasing awareness coupled with increase in government funding, and developmental initiatives in healthcare facilities in the region. Moreover, low cost of manufacturing in China and India has resulted in the rise in production facilities, attracting key players to the region from across the world. BRICS (Brazil, Russia, India, China, and South Africa) countries are among the fastest-growing economies in the world. According to Siemens Healthineers, health care expenditure in emerging economies increased 11% from 1995 to 2012, which is expected to reach 33% by 2022. Rising population in emerging countries is likely to lead to increased demand for pharmaceutical and biopharmaceutical products in the near future. Key players operating in the global gynecology drugs market include Eli Lilly and Company, Pfizer, Inc., Merck & Co., Inc, Amgen Inc., AstraZeneca, F. Hoffmann-La Roche Ltd., Allergan Plc, and Bayer AG. These companies have diverse product offerings and extensive distribution systems across the world. Moreover, entry of small players, especially in emerging markets of Asia, is being witnessed. However, stringent regulatory framework and high-quality standards set by market leaders are anticipated to restrain the penetration of new entrants in the market. This report analyzes the current and future scenario of the global gynecology drugs market. High incidence and prevalence of gynecology diseases and rise in patient awareness are major drivers of the global market. The global gynecology drugs market report comprises an elaborate executive summary, which includes a snapshot that provides information about various segments of the market. It also provides information and data analysis of the global market with respect to segments based on therapeutics, indication, distribution channel, and region. A detailed qualitative analysis of drivers and restraints of the market and opportunities has been provided in the overview section. Additionally, the section comprises competitive matrix and company profiles with business overview to understand the competitive landscape in the market. This section of the report also provides market attractiveness analysis by region and market share analysis by key players, thereby presenting a thorough analysis of the overall competitive scenario in the global gynecology drugs market. The global gynecology drugs market has been segmented based on therapeutics, indication, distribution channel, and region. Furthermore, in terms of therapeutics, the market has been divided into hormonal therapy and non-hormonal therapy. The non-hormonal therapy segment is likely to account for a leading share of the global market during the forecast period owing to the effectiveness of the products, rise in adoption of these products, and new product development. Decreasing use of hormonal products due to the risk of breast cancer has boosted the demand for non-hormonal pharmaceutical products. In terms of indication, the global market has been classified into gynecology cancers, endometriosis, female infertility, menopausal disorder, gynecology infections, polycystic ovary syndrome, contraception (birth control), and others. In terms of distribution channel, the market has been segregated into hospital pharmacies, retail pharmacies, and online pharmacies. The online pharmacies segment is estimated to expand at a significant CAGR during forecast period, owing to the ease of use of online pharmacies and a rise in the number of internet users. The market size and forecast for each of these segments have been provided for the period from 2016 to 2026, along with their respective CAGRs for the forecast period from 2018 to 2026, considering 2017 as the base year. 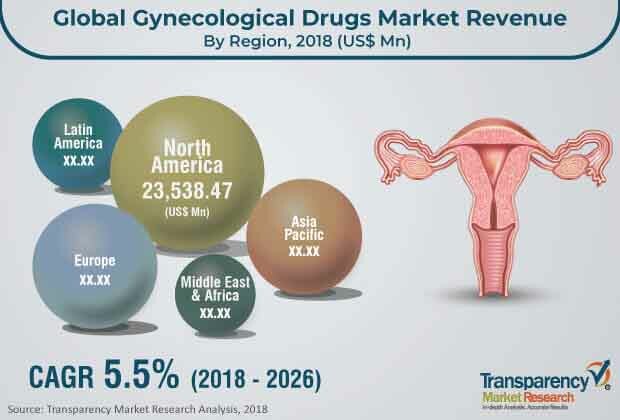 In terms of region, the global gynecology drugs market has been segmented into five major regions and key countries/sub-regions: North America (the U.S. and Canada), Europe (the U.K., Germany, France, Spain, Italy, and Rest of Europe), Asia Pacific (India, China, Japan, Australia & New Zealand, and Rest of Asia Pacific), Latin America (Brazil, Mexico, and Rest of Latin America), and Middle East & Africa (South Africa, GCC Countries, and Rest of Middle East & Africa). The market size and forecast for each of these regions and countries/sub-regions have been provided for the period from 2016 to 2026, along with their respective CAGRs for the forecast period from 2018 to 2026, considering 2017 as the base year. The research study also covers the competitive scenario in these regions. The report also profiles major players in the global gynecology drugs market based on various attributes such as company overview, financial overview, product portfolio, business strategies, and recent developments. Key players in the global gynecology drugs market are Eli Lilly and Company, Pfizer, Inc., Merck & Co., Inc, Amgen Inc., AstraZeneca, F. Hoffmann-La Roche Ltd., Allergan Plc, and Bayer AG.